One of the most-frequently mentioned persons in CWBChicago’s five-year history is out of prison and up to her old antics, according to police and court reports. 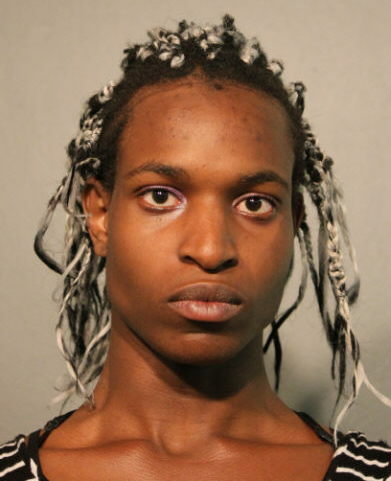 Keith Williams, a 25-year-old transgender woman, was paroled in January after serving one year of a two-year sentence that she received for unlawful restraint in connection with a robbery in Boystown on July 15, 2016. Now, she’s in Cook County Jail, charged with two fresh violent attacks. On May 9, Williams beat two men with a wrench in the 3600 block of North Ashland, according to prosecutors. The men were said to be “bleeding profusely” when police arrived. Both were taken to Advocate Illinois Masonic Medical Center by ambulance for treatment of their injuries. Williams, who allegedly slipped away, was arrested when she was spotted in the same area last week. He’s charged with two counts of battery. Judge Peter Gonzalez set bail at $5,000. Back on April 24, Williams was arrested at a Target store in the McKinley Park neighborhood after a store security guard recognized him as the person wanted for attacking an employee and stealing from the chain’s Uptown store days earlier, according to court records. Prosecutors say Williams tried to steal merchandise, bit a security guard who intervened and brandished a weapon during the incident. Despite the two fresh charges against Williams, the Illinois Department of Corrections has not moved to revoke her parole. 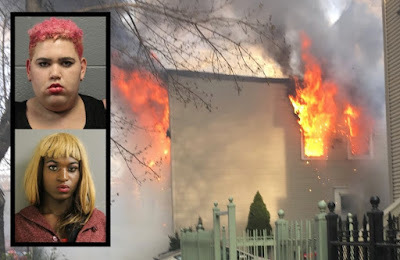 Williams (bottom) and Handzel pleaded guilty to setting this Boystown fire. Williams first made the pages of CWBChicago in October 2014 when—in the course of just seven days—she managed to get arrested twice and beaten up once on Halsted Street in Boystown. A long-time darling of the Boystown social service agency circuit, Williams pleaded guilty to burning down a 126-year-old Boystown home in May 2016. She received probation for that case. Williams’ co-defendant in the house fire, Ryan Handzel, is currently in jail awaiting trial for allegedly robbing a man at knifepoint near the Belmont Red Line station last month.